Engine swaps are a common fantasy for gearheads, but this particular alliance is something few outside of a padded room would have ever considered. The Triumph TR6 has a classic British roadster shape. Its '60s styling looks totally perfect today. But being a '60s British roadster, it isn't that powerful and isn't that reliable. Crafty engineers at the Southern California shop Schraders Speed and Style thought of a way to modernize the engine with some Japanese knowhow. This 1969 TR6 is British on the outside, but has the innards of a few Nissans. A 2.5-liter RB25DET turbocharged straight six from a Skyline was wedged in where the old British six, with about 100-ish horsepower, went. Schraders' guys estimate 380 crank horsepower from their creation. The rear suspension comes from Nissan too, as an Infiniti Q45 donated a center section and a limited-slip diff. The blurb from the Schraders website said the owner brought the TR6 to them in 2005 and wanted to slip an LS1 in it. That would have been bonkers but predictable. Inside, there's a custom metal dashboard that looks absolutely wicked and satellite navigation. They say basically everything but the body is new. Which means there's a good chance it's put together better than it was in 1969. The buy-it-now eBay listing ended Thursday with no takers for the TR6. 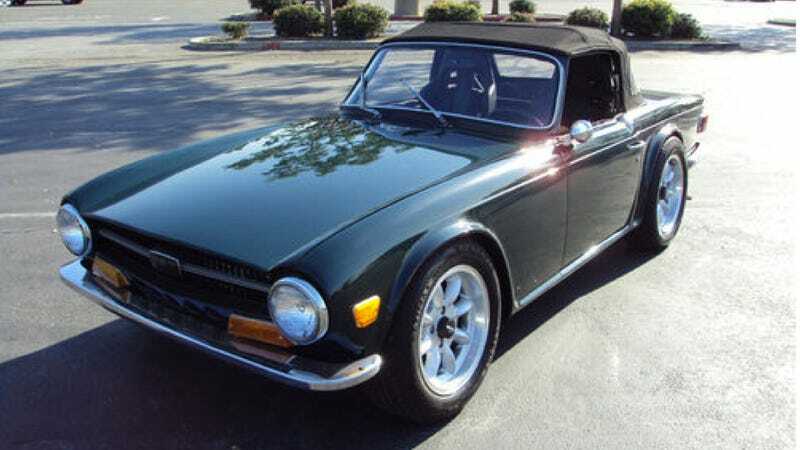 It might have something to do with the $32,000 asking price – TR6s, really nice ones at that, go for far less. Still, this digitally remastered British roadster has the good looks and the high probability of starting every time you turn the key. And it's so much cooler than a Miata.